Holder of dozens of patents, inventor of everything from maximally accurate maps to a three-wheeled motor vehicle, author of epic poetry and coiner of countless neologisms, the late architect, futurist and all-around genius R. Buckminster Fuller is one of the most remarkable figures of the 20th century. Fuller's fascinating story comes to life this week in Burlington in a project as unusual and multifaceted as the man himself. 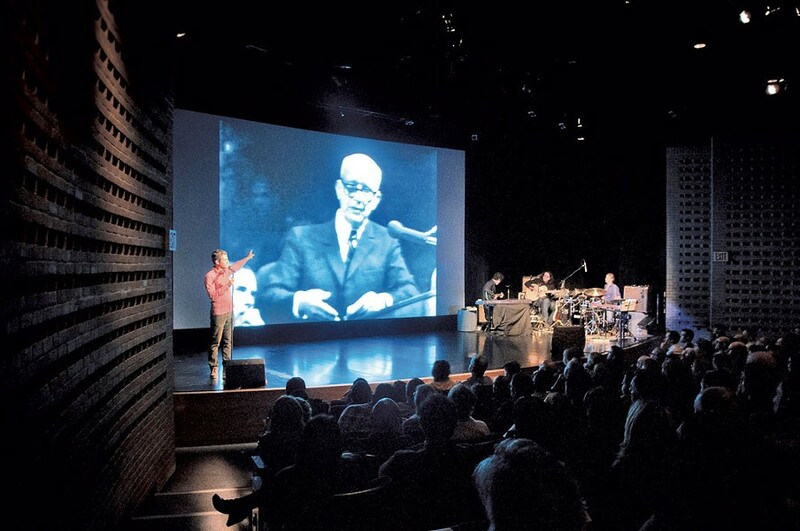 The Love Song of R. Buckminster Fuller is part movie, part concert and part multimedia conference talk, in a way that the polymathic Fuller would surely have appreciated. Billed as a "live documentary," the event features photographs and video clips of and about Fuller provided by filmmaker Sam Green. Indie-rock titans Yo La Tengo will perform a live, partly improvised musical score. Green himself will be on hand to play the part of MC and lecturer. Hosted by the Flynn Center for the Performing Arts, the event is cosponsored by an array of local arts organizations, including the University of Vermont's Lane Series and the Vermont International Film Foundation. Director Green has explored this unusual form in a previous work, the 2010 live documentary Utopia in Four Movements. Consequently, the directors of the San Francisco Museum of Modern Art asked Green to create a live documentary about Fuller for a 2012 museum show. "At that point," says Green in a phone interview, "I knew only what most people knew: that Fuller was 'that dome guy' from the '70s." As he researched, Green would soon learn that Fuller's legacy extended far beyond his best-known architectural creation, the geodesic dome. Almost too far beyond. Green discovered that the personal archive of R. Buckminster Fuller (who preferred to be called Bucky) is one of the most massive ever assembled, consisting of hundreds of thousands of items that Fuller organized and filed nearly every day of his long professional life. Less daunted than intrigued, Green dove in and found himself more and more drawn to Bucky's notions "about sustainability and about using design to solve problems," the director says. "His ideas are very practical, but there's also something utopian about them, in the best sense of the word." Green planned all along to accompany the piece's visuals with music, and he found himself a lulu of a musical collaborator. Yo La Tengo, whose three-person lineup has remained unchanged for more than two decades, may never have released a top-10 single, but they have a cult following and have received critical acclaim. The band also happens to have experience in live accompaniment for film, having scored and performed a 2001 program of short aquatic documentaries by famed nature filmmaker Jean Painlevé. Green saw that performance and calls it "one of the five best cinematic experiences I've ever had." He approached the band when they were between projects, and they signed on. Like Green, Yo La Tengo bassist James McNew was only generally aware of Fuller before this project. "It's not like my parents had a dome or anything," he says, "but you kind of knew who he was." Delving in, McNew found Bucky's work "mind-blowing," and he never tires of watching the film when he accompanies it, he says. McNew especially likes the project because, unlike the Painlevé film, it involves "a third entity" — that is, Green — who runs the show. Green says he designed The Love Song of R. Buckminster Fuller to hark back to the earliest days of cinema, when such multimedia screenings were commonplace. Green, who studied with groundbreaking experimental documentarian Marlon Riggs, is also influenced by the lecture-accompanied travelogue films of his youth. Ironically, it's new, digital technology that has allowed Green to realize his own live documentaries more fully. "The truth is that, until very recently, there was no way someone could do what I'm doing," he says. "I'm bringing a laptop that has HD footage on it, and people have great projectors now. Even seven years ago, there weren't projectors good enough, and the media wasn't portable enough. Not to make it sound too grandiose, but this is pretty cutting-edge, even though it's an echo of these earlier forms." While the piece itself may be unconventional, Green says the inspiration behind it is pretty old-fashioned. While he's not opposed to the fragmented viewing that digital technology can engender, he's a fan of "the collective experience" of attending a film with an audience. He's also attracted to the ephemerality of live performance. "I'm moved by the idea that we do the show and there's nothing that exists from it — just a memory," he says. Given that his piece portrays one of the last century's most multifaceted figures, Green has stacked the deck in his favor. The original print version of this article was headlined "A Multimedia Documentary Brings R. Buckminster Fuller's Legacy — and Yo La Tengo — to Burlington"